At TEDGLOBAL in Arusha, Tanzania in June, 2007, we launched the "Africa Cookbook Project," whose goal is to archive African culinary writing and make it widely available on the continent and beyond. 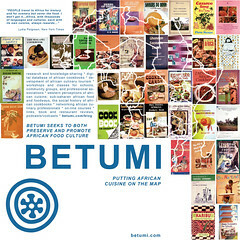 A database is being developed and copies of hundreds of cookbooks are already being catalogued at BETUMI: The African Culinary Network. Google has offered assistance in eventually digitizing some of the information. The enthusiasm and tangible support both at and after the conference is wonderful. Issa Diabate has already e-mailed that he's sending an Ivorian book, Dominique Bikaba that he's searching for one from DRC, and Jens Martin Skibsted has scanned the covers of several books in his collection. People have promised to send books from Angola, Mozambique, Zambia, etc. I'm thrilled that others recognize the urgent need to protect these books, whether for their value as a record of popular culture, social history, or, my specialty, culinary creativity. When I stopped in both gift shops at Kilimanjaro airport, they confidently showed me several glossy books published in Zanzibar like Safari Living, which showcased what I call "cuisine for Westerners," and were unable to produce a single "black Africa" cookbook. There's work to be done. Help spread the word, and also help us build up this data base and archive. Will be sure to blog about it. Thanks, Juliana. It's great to see "betumi" power at work: the concentration of ability, many strands coming together to form a strong rope. Afromusing.com is another great resource. What a project! The Africa Cafe in Cape Town serves amazing traditional dishes from around the Continent and their cookbook is wonderful. Perhpas they could be a good resource for you as well. Good luck! If you look carefully at the poster with a few of our cookbooks, on the top line, far left, you'll see The Africa Cafe Experience: Flavours of Africa. I haven't been there yet, but the book was given to me and the restaurant sounds great, plus I've heard from others that I need to go there. I tried posting a picture of the cover in this comment, but can't figure out how to do it. I'll put it up on my blog so you can see it.